Wow! Thanks to a post at the lovely French for Cupcake (you should check it out, Claire's an amazing baker and all round domestic goddess) my blog hits have gone through the roof this week and I have gained some new followers, so, hello! Do say 'hi' back - I don't bite and I love talking to people. Anyway, this in turn induced blogger's guilt. I felt I should blog something nice. Something a bit special. Something that's really easy, but would snare the heart (or at least, stomach) of a hot date. Hell, if anyone gave me pan-fried sea bass, I'd be theirs. 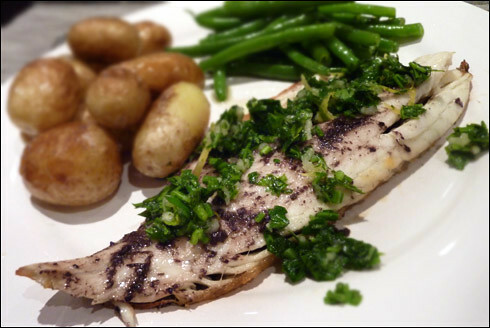 I've used a little tapenade to bring out the gorgeous, delicate flavour of the sea bass, and accompanied it with gremolata, which is also lovely with steak or chicken. You can make the Gremolata up to an hour in advance. I advise that you do, as it gives the flavours a chance to combine. Finely chop the parsley and crush the garlic then add the lemon juice, lemon zest, olive oil, salt and pepper. Mix together and then set aside until you're ready to dish up. Spread half a teaspoon of tapenade over each fillet and drizzle with a little olive oil (not too much, you don't want to make the fish greasy). To pan-fry the sea bass, heat 1 tsp of oil in frying pan over a medium heat. Place the sea bass skin side down and fry gently for 2-3 minutes, until seared and crisp. Turn and fry for a further two minutes. The flesh will begin to flake and turn opaque when cooked. Once cooked, spoon the Gremolata over the sea bass. I served this with french beans and semi-sautéed baby new potatoes. Looks delicious - if anyone presented me with a plate of food that looked like that, I too would be theirs! I'm not sure that this was what the Pope had in mind when he switched us all back to eating fish on Fridays - YUM YUM! No sense of self-denial here! Thank you very much for the recipe! Happy weekend!